Discussion in 'Canon InkJet Printers' started by marco, Feb 26, 2017. Hi, I come straight to the point. When i print without edges, at the end of the sheet there is a slightly different color line. I have this problem with a3+ sheets. I use hahanemuele fine art baryta satin, or photo luster. I don't know if the problem is due to the paper or printer. I attach 2 photos. Canon were, BUT 3D is better.. I tried to change the print settings. I created different sized papers (35x53 cm) and the line is no longer there, because the printer draws this line always at 3.5 cm from the bottom edge, any sheet paper I use. Thus, printing on paper a3 + (32,9x 48.3 cm) the line would be drawn at about 1.5 cm out from the sheet. As a solution, it is ok, even if, at the upper edge appears of a 0.5 cm edge that can not be eliminated. Bah!!!! I could not fix it. 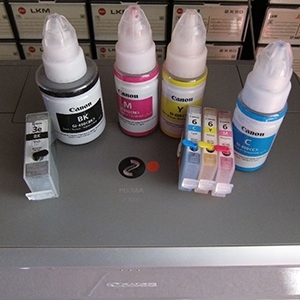 The service said that the printer does not have any mechanical problem and the print head works well. It may depend on the ram? Does anyone have the canon pro1 service manual? please Help me. I tried with all available sheets. Even with the original canon sheets. Same problem. Tried even on different PCs.HELP!!!!!! PM me and I’ll arrange to get you a Service Manual..